Roughly 80 to 90% of the plants you add to your pond are considered "marginal" or "bog"
whether the plant is hardy or tropical on the label. haven't been saving your large nursery pots, you can ask your local nursery for some, or find that friend who saves everything. nursery pots do just fine. to use anything with a lot of organic material in it because this will decompose quickly and foul your water. Plus it's STANKY!! You especially DON'T want to use potting soil, as it is LOADED with organic material. the pot to help prevent your fish from poking around in there and stirring up the planting medium. 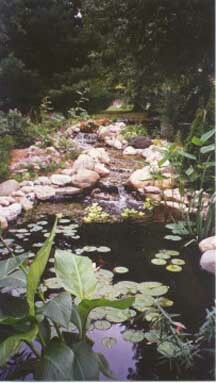 eliminate bubbles coming up through the planting medium and clouding the water. To learn how to repot a water lily, CLICK HERE. To see marginal plants we currently have for sale, CLICK HERE. To see water lilies we currently have for sale, CLICK HERE. To go to the Main Plant Page for other options, CLICK HERE. When you go shopping for plants, look for something that has a good root structure. Sometimes you can get two or three starts from one pot, if you're paying attention. system will help your plant get off to a strong start.